Details: A DBPro daughter board and Audio Control Module for unrivalled audio playback and content creation. View larger Studio-grade content creation with hardware that uses only audiophile-grade components. 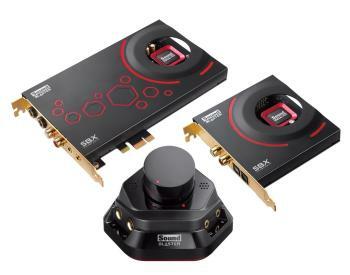 The Sound Blaster ZxR has a signal to noise ratio or SNR of 124dB meaning your audio will be more than 99.99% pristine, which is over 89.1 times better than motherboard audio. Enjoy reduced latency as low as one millisecond with Audio Stream Input/Output (ASIO) support. Stereo Direct lets you listen to your music pure and unprocessed at the amazing bit rate of 24-bit 192 kHz. In addition, SBX Pro Studio sound technologies create unprecedented levels of audio realism, including stunning 3D surround effects for your speakers and headsets. Add studio quality audio sound tracks or voice tracks to your video clips or home videos created with hardware that uses only audiophile-grade components such as 123dB analog-to-digital converters (ADCs) with RCA Aux-in and optical inputs for outstanding recording quality. With the 600 ohm headphone amplifier, you can do studio-grade monitoring as well. 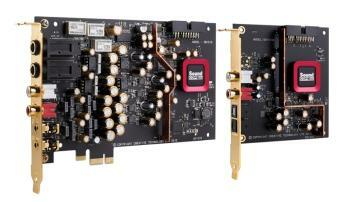 The DBpro is another reason why Sound Blaster ZxR delivers only the best audio playback and creation. It offers optical output for outstanding audio playback, plus professional-grade ADCs with RCA Aux-in and optical inputs for studio-grade recording quality. With the Sound Blaster Z-series Control Panel, just toggle between your headphone and speaker system with a flip of a switch. Also, take control in style and ease with the ACM that incorporates a built-in microphone array and mic/headphone I/O connections. The knob on the ACM lets you conveniently adjust the headphone levels. The multi-core Sound Core3D audio processor is designed to offload SBX Pro Studio and CrystalVoice effects processing from your primary CPU, improving your overall PC performance, resulting in drastically superior audio and voice quality. Experience crystal clear communication with your teammates with the CrystalVoice suite of technologies that removes echoes, ambient noises and picks up your voice from within a zone (Voice Focus). It also maintains your voice level even if you are near or further away from the microphone. You can also connect to your home theater system through a single digital cable and enjoy cinematic DVD movies by transforming any stereo or multi-channel streams into high fidelity immersive surround sound.